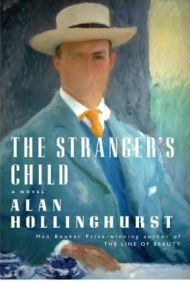 The Stranger’s Child by Alan Hollinghurst is a large book which spans the majority of the 20th century. It tells the story of a young poet, Cecil Valance, although he dies relatively early in the story during the First World War leaving behind a modest group of poems, mainly secondary rate, but one or two of which enter the public consciousness in the English-speaking world. The fulcrum of the novel is a weekend in the late summer of 1913 when Cecil comes to stay at the house of his close Cambridge friend, George Sawle. The actions of Cecil during that weekend and the ways in which he interacts with the Sawle family members and their retainers sends out ripples which penetrate the remainder of the novel and eventually extend into the late 20th century. The Stranger’s Child is Hollinghurst’s first novel since The Line of Beauty won the Man Booker prize in 2004. His work can be placed firmly in the world of literary fiction, with a focus on gay male characters, although he also writes from other perspectives well. Indeed, some of the leading characters in this book are female, unusual in a Hollinghurst novel. The Stranger’s Child is full of interesting figures drawn mainly from the upper middle-class world. We see them at different stages of their lives, with the key characters ageing from their teens through to the seventies during the course of the novel. The process of their aging is not continuous, as the different sections of the book jump forward skipping out long periods of time. In each section, we observe the beginning of interactions which have their consequences many years later in a subsequent part of the book. Linking it all together is the character of Cecil Valance, and how people begin to picture and remember him as time goes on. The first long section, set during the weekend visit in 1913, allows us to see first-hand and close-up what happens during those critical few days. In subsequent chapters and sections we see how people remember the events of that weekend, and how public knowledge of them and of the character of Cecil evolves and changes as time goes by. The theme of the unreliability of memory underpins this book as it has done other novels this year, including The Sense of an Ending by Julian Barnes and There But for the by Ali Smith. It seems a strange coincidence perhaps they were all participants of at some dinner party or conference conversation a few years ago! I don’t think that this is Hollinghurst’s best book. I didn’t feel compelled to keep reading it night after night to get to the end. However, it is still a very fine literary novel, and surely deserved to be on the shortlist for this year’s Booker prize. The fact that it failed was the subject of considerable debate, and something for which the shortlisting panel were heavily criticised. However, regardless of this, it is well worth a read. No Comments on "The Stranger’s Child"